But let it be the inward adorning and beauty of the hidden person of the heart, with the incorruptible and unfading charm of a gentle and peaceful spirit, which is not anxious or wrought up, but is very precious in the sight of God. We have to learn how to wear clothes that compliment our figure types. We make ourselves look bad by wearing outfits that are not suitable for us. There are four basic figure types: 1) “apple-shaped” -large top/small bottom, 2) “pear-shaped” – small top/large bottom, 3) “ruler-shaped” – even throughout without a waistline, and 4) “hourglass-shaped” – proportionate throughout. To compliment our figure types, we must create visual balance. We do this by purposely drawing attention to our smaller areas. Our eyes are drawn to bright colors and detail, so we should put these things on our smaller areas to make them appear larger. For example, if you are apple-shaped (heavier on top), you should wear outfits that add volume on the bottom, like wide-legged pants and flared or pleated skirts. If you wore busy prints or bulky fabrics on top, you would simply make your upper body look bigger. Another tip for you is to add detail to your waist with attention-getting belts and sashes. Likewise, if you are pear-shaped (heavier on the bottom), you should wear brighter colors and patterns on your upper body. You should also wear jackets with a lot of detail and feel free to wear scarves. Your goal is to draw the eye upward so that your hips are seen in the peripheral vision. If you are ruler-shaped (even throughout, without a waistline), wear outfits that make you look as though you have a waistline. Wear attention-getting belts and sashes around your waist. Fitted jackets will also help create the appearance of a waistline. Again, the eyes will be drawn to your waist with the other parts of your body kept in peripheral vision. Now, if you have the perfect, hourglass figure, consider yourself blessed. You can wear anything. You have no real concerns unless you are heavier than you would like to be. If this is the case, wear softer fabrics. Soft fabrics are very complimentary to the hourglass figure. They do not make you look bigger, but simply drape your figure. Bulky fabrics, obviously, add bulk and exaggerate your figure. All figure types should wear more fitted outfits. Note, I am not talking about skin-tight, red-light district outfits, but merely fitted outfits. Hire a seamstress to cut your clothing to your specific measurements. This is a really good tip if you are heavier than you would like to be. Often heavier ladies opt for loose-fitting outfits to try to hide their figures. This technique actually backfires because the loose-fitting clothes cause the eye to see volume and make the lady look at least 10 – 20 lbs. heavier than she actually is. If this is you, come out of hiding and make the most of what you have got. It will work if you work it. Now, that we know how to dress for our figure types, we will want to purge our closets. We will, of course, want to get rid of everything that does not compliment our figures. However, more importantly, we will want to get rid of everything that does not make us feel special or attractive when we wear it. All of the clothing and accessories that you have which makes you feel ugly or just “so-so,” also will make you feel “less than” when you wear them. This lack of confidence comes across to the people with whom you come in contact. So, have a garage sale or give those things that are not benefitting you to charity. They’ll benefit someone else. Then be Proverbs 31-smart and invest the proceeds from the sale. Or if you give the clothes to charity, deduct the contribution from your taxes. Make-up is designed to enhance your facial features and make you more appealing. The easiest way to learn how to apply make-up is to have a makeover, take pictures of the session, and ask lots of questions. Most cosmetic lines will give you a makeover with the purchase of their products. After a few of these sessions, not only will you have the cosmetics that you need, but you will also have learned valuable tips and have many pictures from which to practice. I suggest that if you are totally new to make-up that you take pictures of every stage: foundation, eye colors, blush, and lipstick. Bring a friend with you to take the pictures. Ask the make-up artist to tell you what they are doing as they do it and to also write down the products that they are using. Some cosmetic lines will even “paint” the make-up onto a canvas (with an outline of a face on it), so that you will know exactly where to apply the make-up. Once you are at home, take your pictures, products and notes, then get before a well-lighted mirror, and practice, practice, practice. You may look like Mardi Gras when you first get started, but hang in there. Practice makes perfect. Ask God to help you and he will. I also suggest that while at the cosmetic counters, ask them for an everyday look and a dressy look. This way you will be ready, no matter what the occasion. In addition to visiting cosmetic counters, you should also read beauty magazines and beauty books. These will give you more tips and help enhance what you learn at the counters. 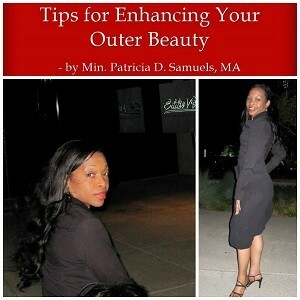 In addition to dressing for your figure type, learn how to accentuate your good features. For example, if you have great legs, show them off. Now, wearing a miniskirt to church is not a good idea; however, knee-length skirts or skirts just below the knee are both modest and attractive for the leggy woman. Similarly, if you have a small waistline, wear the waist-cinching outfits like the short, fitted jackets that have peplums. If you have a great smile, smile…a lot. Even if you do not have a great smile, consider smiling because doing so will put a twinkle in your eye and make you more inviting. Another example is to play up your eyes, if you have pretty eyes. Make them up with eye shadows and mascara, etc., so that they will be showcased over, for example, a not-so-great smile. Again, I count not myself to be a fashion/beauty consultant, nutritionist, or physical fitness expert. However, I have learned a few things along the way. It will work if you work it! Please share any aha’s, comments or questions below. I would love to connect with you here. Please share with your friends also, using the buttons below and thank you for sowing financial seed into Patricia Samuels Ministries to enable the Gospel to be spread throughout the earth!